OnePlus is currently gearing up for the launch of its next flagship device which is the OnePlus 6. A lot of teasers, leaked images and specs have all given us an insight on what to expect from OnePlus' next device. 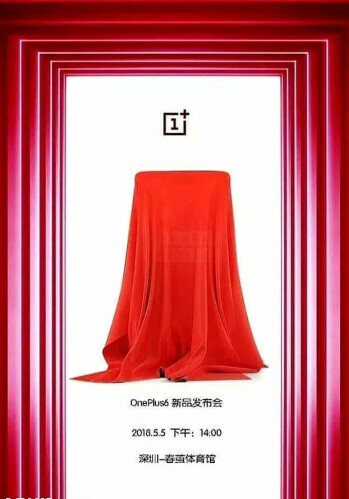 Latest reports from China suggests that the OnePlus 6 might be launched on May 5th which is less than a month away. The image which was leaked by a Chinese online retailer which is known for teasing upcoming devices reports that the launch event will take place in Shenzhen, China at 2PM local time. This is just less than a month away. Going by what we already know about the upcoming OnePlus 6, the device will be powered by Qualcomm's most efficient Snapdragon 845 chipset alongside a massive 8GB RAM and a 256GB Internal storage. The bezels on the display will also be trimmed down a lot further than on last year's OnePlus 5t but with an iPhone X like display notch. Even though this report is from a fairly reliable source, it's still advisable you take this news with a pinch of salt as OnePlus is still yet to release any official statement on it. Nonetheless, we don't expect this report to be anything far from the truth.